Brenny Evers is a product from the PSV youth academy. He moved abroad in 2001. After four seasons at KFC Uerdingen (Regionalliga Nord) Brenny Evers moved to the south of Germany. 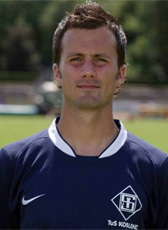 He played for TuS Koblenz in the 2.Bundesliga until 2008. In August 2008 he decided to return home and signed a contract at MVV Maastricht. In July 2010 he was given a new contract as semi-prof, giving him a chance to build up a new career after football. After expiration of his contract he received new offers from Topklasse club EVV Echt and a German lower division club. Evers decided to join EVV for the 2011-12 season and retired a the end of the season.